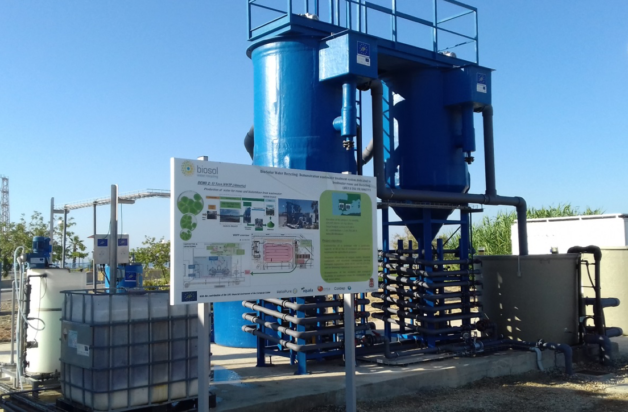 LIFE BioSolWaRe progress in the Demo 2 plant in El Toyo WWTP (Almería) has reached two months of continuous operation since the experimental plant was started-up and officially inaugurated on the 26th of July 2018, when the Municipal Mayor of Almería and local authorities from the Council visited the plant. This event had a wide impact in local media providing a broad visibility to the BioSolWaRe Project. 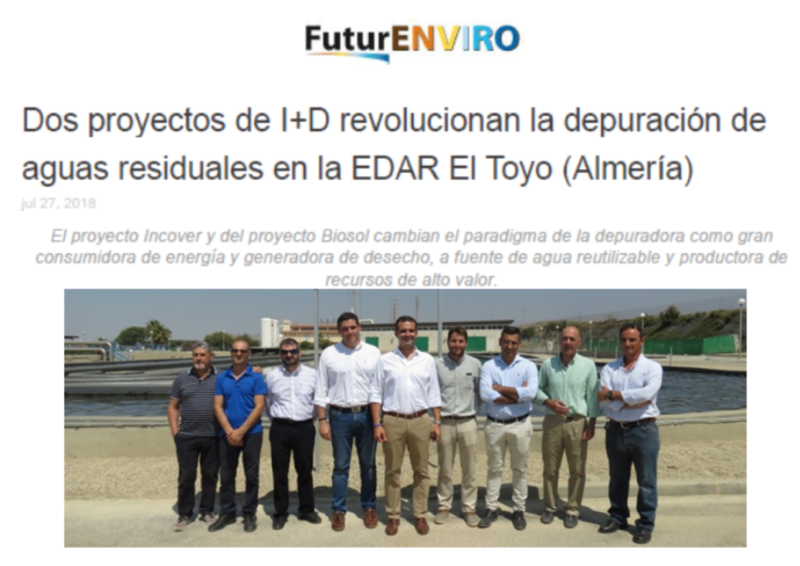 Moreover, several visits to Demo 2 plant have been also achieved in this period due to the high interest and impact of this project in Almería. University groups, high schools or local authorities from Aqualia are some examples of the last visits that the plant has received. 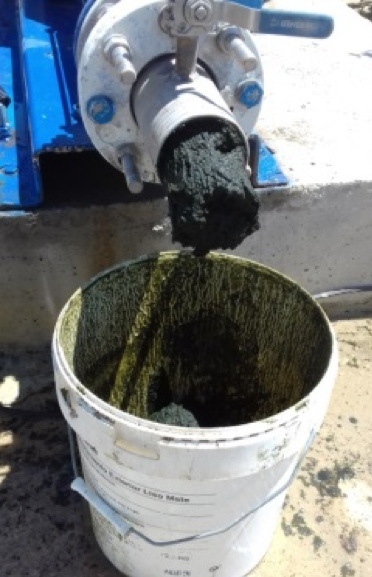 Concerning Demo 2 plant operation, the 3000 m2 raceway has been continuously fed with sieved raw wastewater for two months and microalgae biomass has been harvested in a continuous mode. Under summer favorable conditions (solar radiation > 6.5 kWh/m2), microalgae reactor has led to high removal efficiencies, a high algae biomass productivity (up to 100 g TS/m2/day) and would be able to produce over 100 t/year of dried biomass. 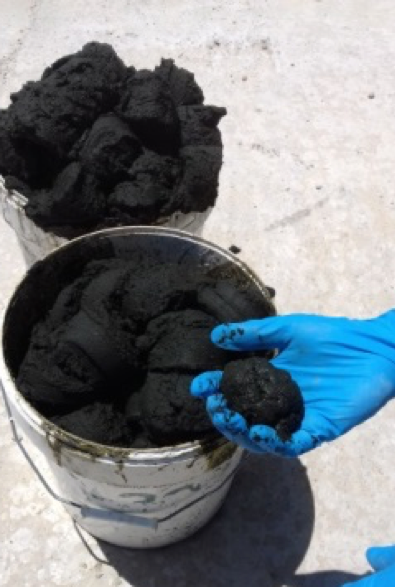 Operational parameters, such as reagents dosing or hydraulic retention times, have been optimized obtaining a thick biomass over 4% solids content after flotation units. First centrifugation trials have produced a dehydrated biomass that meets the technical requirements for biofertilizer production, containing close to 40 % proteins. Further hydrolysis trials will confirm the quality of the produced biomass as biofertilizer.